You probably know who Dan is already, maybe without realizing it. It's estimated that in America, every night, at least eight bands cover the song he is most known for, Keep Your Hands To Yourself, which he recorded with the Georgia Satellites back in 1 986, that's right, over thirty years ago. A song which Rolling Stone magazine recently credited as the song which, more than any other, spawned the 'country song with rock guitar crossover'. It's also a song which has turned up on the soundtrack of Coyote Ugly, Sweet Home Alabama and The Expendables, as well as featuring in a recent Buick Motors TV ad and a memorable episode of Beavis And Butthead. It's been covered by everyone from Hank Williams Jr to Kid Rock and Kenny Chesney used the song as the encore on his last tour. But, there's a lot more to Dan than that one song. Like many of his contemporaries, he learnt his craft on the US bar circuit, before signing to Elektra and breaking through with Hands and the eponymous Georgia Satellites debut, both kept of their respective Nol slots by Bon Jovi's Living On A Prayer and Slippery When Wet. Dan went on to record two more albums with the Satellites, Open All Night and In The Land Of Salvation And Sin, as well as contributing a cover of the Swinging Blue Jeans evergreen classic, Hippy Hippy Shake to Tom Cruise's hit film Cocktail. He'd always been the chief songwriter for the Satellites, but increasingly felt the need to stretch his wings and to record material that he thought would not necessarily fit in with the bands sound. First in the long line to sign him as a solo artist was Rick Rubin (Beastie Boys, Johnny Cash, Slayer), someone who knows a hit when he hears one. And sure enough, Dan was to score another American hit with I Love You Period from his debut solo album, Love Songs For The Hearing Impaired. Buffalo Nickel followed. It signaled Dan's coming to terms with his status as an elder statesman of rock, and, it was no real surprise when he decided to take time out from his solo career to try his hand as a producer. This proved to be a fruitful phase of his career and saw him working with, amongst others, The Bottle Rockets and Chris Knight. He returned to performing with the 'alt supergroup' The Yayhoos, joining Eric Ambel, Terry Anderson and Keith Christopher. Europe had always remembered Dan fondly and in the early 2000 's, he started to make regular visits. Joining Dan was fellow ex Satellite, drummer Mauro Magellan and founder / member of Americana Hall Of Fame Lifetime Achievement winners Jason And The Scorchers, guitarist Warner E. Hodges, the line up completed by long time collaborator, Keith Christopher, who it was who named the band Homemade Sin. Keith was replaced by Micke Björk in 2015. 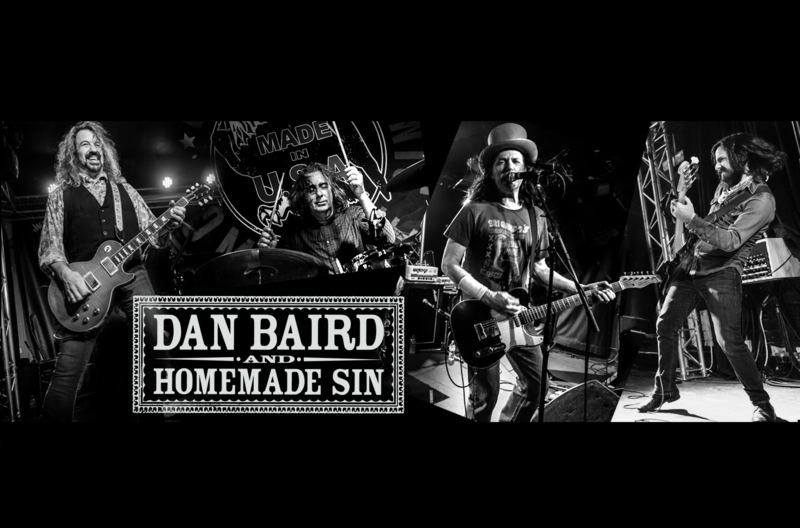 2017 is all set to be the busiest year yet for Homemade Sin, with tours confirmed for the US, Australia, UK, Sweden, Norway, Germany, Switzerland, The Netherlands, Italy, Spain and appearances on several high profile festivals. March will also see the release of their fourth studio album, Rollercoaster, but not before Dan has released another solo album, the cleverly titled, SoLow (think about it). The band has a reputation for being one of the best live acts on the circuit, appearing at the Sweden Rock festival in 2009 and 2016, Hard Rock Hell in 2011 and 2012. They also headlined the prestigious Kilkenny Festival in Ireland in 2012. 2017 sees them at the Ramblin' Man Fair Festival, the Zwarte Cross Festival and more to be confirmed. They have established an annual series of concerts in London that attract fans from all around the world. Dan remains one of rock's most underrated and insightful lyricists, arguably now writing the best songs of his career. His rhythm guitar playing has lead to favorable comparisons with Keith Richards and Malcolm Young.